On Friday I discovered part of my bike route along Albany’s riverfront blocked. 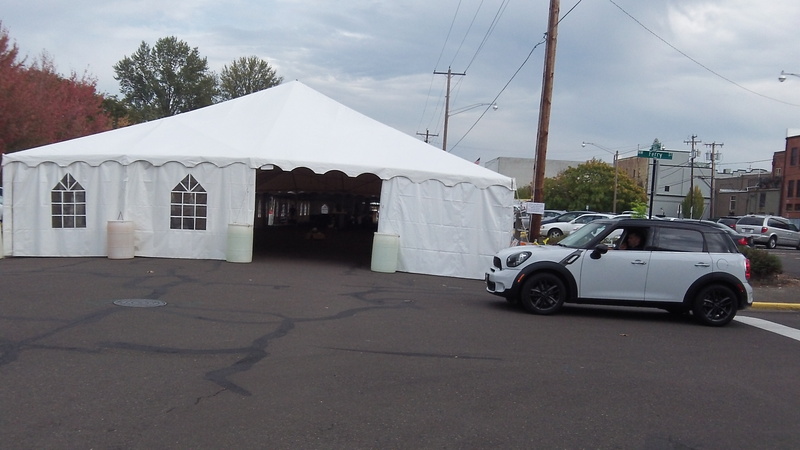 This big tent spanned the width of Water Avenue. What gives, I wondered. Turns out volunteers and workers for various sponsors were getting ready for what they call the annual “Brewfest” on Saturday. It’s a benefit for the Boys and Girls Club of Albany. Which may sound a little strange, considering that for another few years yet, their elders are probably trying pretty hard to keep Albany’s boys and girls far away from the kind of brews we are talking about here. But this is an event for adults and only indirectly for the kids. And it has been held six times before, so the contradiction between the means of benefiting a cause and the cause itself is of long standing. I haven’t paid much attention to this occasion, but I’m told that as the name implies, it involves food and plenty of different brands of beer including local ones. They also plan to show the football game between Oregon State and Washington State, starting at 1. According to a little sign, the road will remain closed until mid-day Sunday, presumably to allow time for the tent to be struck and moved out. Previously, I understand, this benefit had been held at the Linn County Expo Center, but this year it’s here on the riverfront in the middle of the street, between Ferry and Broadalbin. Yep, I agree. Let’s promote one of the two “gateway drugs”. (the other being nicotine, of course) Probably see half of the “no on pot” city councilors down there tomorrow, doing their thing for the kids. Hypocrites. I like beer but I can’t support their hypocrisy. I’ve already got a full growler of my favorite brew and I’ll enjoy it at home watching football with some friends. There are a number of alcohol events that this city blesses, how long until we can have “Leaf Blower” and “Bud Buddies” events?! Good grief! The money benefits kids. If the foam lifts all boats, better for all. I drove by there today when I went to the p.o. not having any idea what it was about. I knew Hasso would write about it if it were anything. Thank you Ray for already pointing out the hypocrisy of this event. Now I don’t have to! I don’t drink, never have, never will. But power to the people and all that. I don’t understand why cannabis (which isn’t harmful) isn’t given the same wide birth as alcohol and tobacco which are the true gateway drugs. Unbelievable.